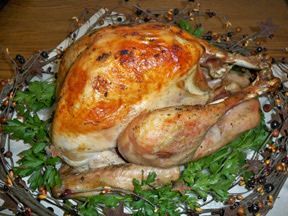 The flavors of bay leaves, onion and oranges permeate the turkey to make it incredibly moist and flavorful. 1. Place oven rack in lowest position. Preheat oven to 325° F. Place roasting rack in shallow roasting pan. Mix first 5 ingredients in small bowl. 2. Rinse turkey; pat dry. 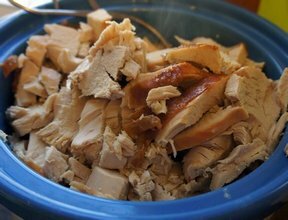 Place turkey, breast-side up, in prepared pan. Sprinkle 2 teaspoons of the seasoning mixture inside turkey. Stuff with bay leaves, celery, onion and orange. Brush turkey breast with oil. Spread remaining seasoning mixture over entire surface and under skin of turkey. Add 1/2 cup water to pan. Cover loosely with heavy duty foil. 3. Roast 1 hour. Remove foil. Roast 2 to 2 1/2 hours longer or until internal temperature reaches 165° F (175° F in thigh), basting occasionally with pan juices. Remove turkey from oven. Let stand 20 minutes. Transfer to platter or carving board and slice. Reserve pan juices to make gravy or to serve with turkey. Test Kitchen Tip: For easy cleanup, line roasting pan with heavy duty foil.